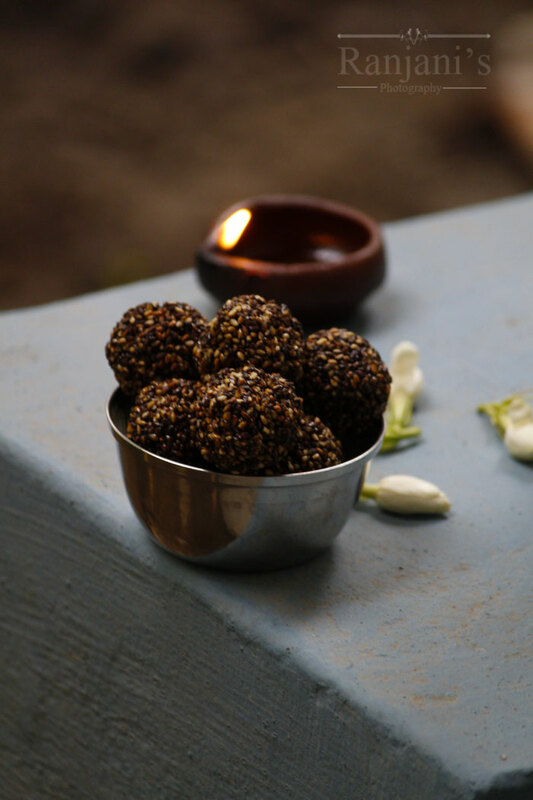 Ellu urundai recipe – thought it’s tough to make and hesitate to make for a long time. Once amma taught me the method I found it’s very easy and less time-consuming recipe. This ellu mithai recipe is usually made during festivals like vinayagar Chaturthi and Krishna Jayanthi. 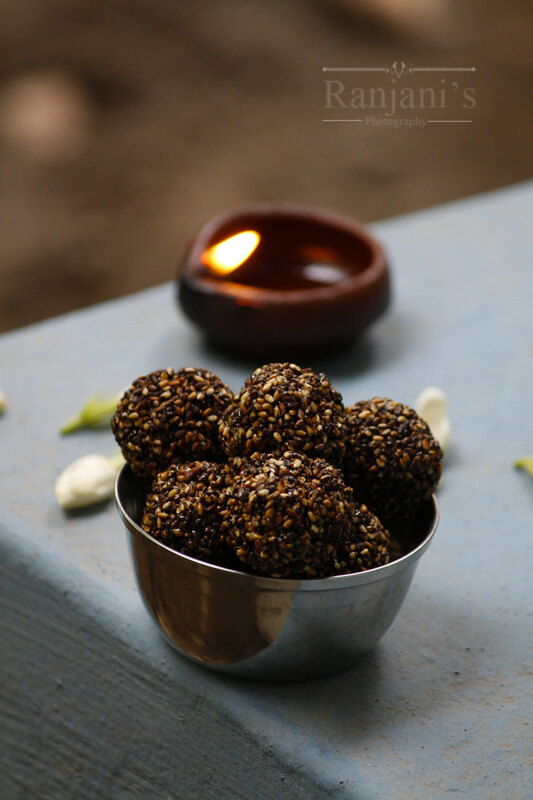 Once you made Jaggery syrup in right consistency, there is no big deal of making this sesame ladoo recipe. You can add some roasted peanuts as I tasted in store bought brands. It is always best to make such nutrients rich recipes at home than store bought. So friends prefer to make healthy snacks at home. 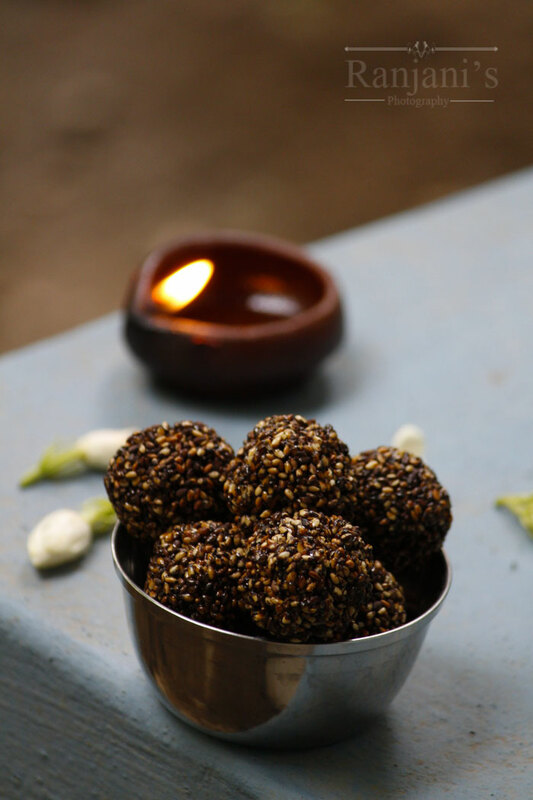 Check out mawa Sesame ladoo and dates peanut ladoo which I posted early using sesame. It’s a rich in protein vegetarian diet, you can sprinkle some seeds in salads and smoothies. It helps to prevent diabetes and cure anemia. There are lots and lots of health benefits in sesame which I can’t finish writing it. Try to include sesame in your daily diet especially black variety. Wok or Kadai, Sauce Pan, Plate, Mixing bowl, Serving bowls or serving plates, kitchen towel to place sesame balls. Heat a kadai, dry roast sesame seeds till nice aroma comes and ellu starts popping. Remove the kadai from heat, place them on a plate to cool down. In a sauce pan, add ¾ cup of Jaggery and ¼ cup of water. Heat until the Jaggery dissolves. Again heat it, till it reaches single string consistency. Place the sesame seeds in a mixing bowl, immediately pour the Jaggery syrup and mix well. Start making balls while it is hot. Otherwise, it won’t come as balls. If your hand can’t resist the heat, dust your hands with rice flour and start making balls. Place all urundai in the plate until it cools completely. While making Jaggery syrup, don’t boil too much as it will make the syrup crystallize. We can’t make sesame balls with it. For 1 cup of sesame, ½ cup of Jaggery is enough. If you feel it’s not enough, you can add ¾ cup of Jaggery. Make the balls when the mixture is heated enough. Once it cools down, it is hard to roll. If the mixture becomes hard, place the vessel in slow flame. Jaggery will start melting, now you can roll as balls. You can store the ellu urundai recipe for more than 10 days. Use black sesame seeds which are good for health.